This Arts and Crafts style vent is offered in solid white bronze which is coated with a clear sealant to help protect the faceplate. The decorative wall vents finish is similar to that of chrome and will look great with other modern accents. Because this Arts and Crafts style vent is made out of solid white bronze, it can be installed onto your ceiling, wall or even into a floor opening. Each decorative wall vents faceplate comes with pre drilled screw holes, unless otherwise specified, to make installation easier. Simply screw mount the unit into place with the screws which are provided. If using on the floor, please specify in customer notes section. These Arts and Crafts style vents are hand made and molded in a sand cast to allow for unique designs every time. 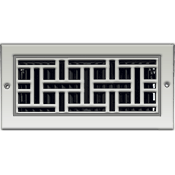 Our decorative wall vents are made in the USA by Classic Grilles and come with a 1/4" thick faceplate to offer an old time feel to the cover. Order your Arts and Crafts style cover with the provided black metal screen to help hide your ductwork from sight. Decorative wall vents will ship once they have been made and for just one low cost! Tip: Arts and Crafts style vents may vary in sizing because they are hand cast. 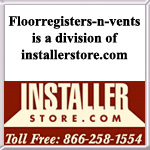 To properly order the decorative wall vents, measure only your hole opening and not an existing vent cover. The 12 x 6 Arts and Crafts style cover will fit over a hole opening of that size. The actual faceplate will measure larger by approximately 2 inches. Important: These decorative wall vents are made upon order and are considered non-returnable and cannot be canceled once purchased. Please allow between 7 and 9 weeks for your shipment to leave the foundry. Our Arts and Crafts style cover is also offered by Classic Grilles with an adjustable damper unit. Check out other decorative wall vents on our site for other design ideas. The white bronze Arts and Crafts style cover is truly one of a kind and will bring any room and style together. Purchase now with us!